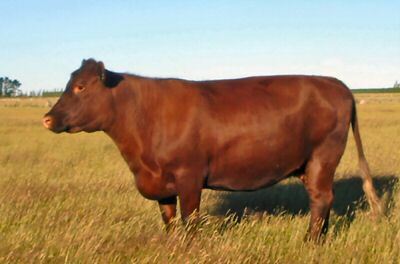 The dual-purpose Red Poll is an old English breed of medium-sized cattle. They originated from crosses of the red horned cattle of Norfolk and smaller dun-coloured polled animals of Suffolk. In 1845 Arthur Low called the breed the Polled Suffolk, but an English Herd Book kept from 1873 to 1882 described them as the Norfolk and Suffolk Red Polled. The breed was exported to America, where in 1883 a Red Polled Cattle Club was formed, and a British Society started up in 1888. In 1908 the official name was amended to Red Poll. The breed declined in its home country during the twentieth century and was eventually classified as rare in Britain. 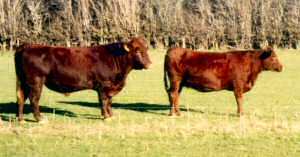 The first Red Poll cattle were imported into New Zealand in 1898 and today are bred in small numbers from Northland to Southland, with perhaps a greater number in the South Island. Although the Red Poll is a dual-purpose animal, it is used principally for beef production in this country, but its good milking ability helps produce a fast growing calf. The meat is fine-grained and is considered to be both tender and tasty. The cows calve easily and are good mothers. These handsome, docile cattle, with their characteristic deep red colouring, are generally highly thought of by their breeders.